Home - Healthwell Clinic - Occupational Health Clinic and General Practice (G.P. Surgery) in Clonsilla, Dublin. 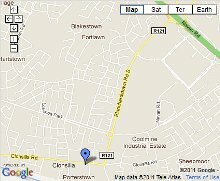 The Healthwell Clinic is situated in Clonsilla Village, Dublin 15, close to St. Mochta's National School. It is easily accessible to the M50 motorway. The Clinic specialises in General Practice and Occupational Health. Dr. John Mc Dermott qualified with his primary degree from UCD (University College Dublin) in 1992. He has Higher Diplomas in both child health and women’s health. He is a member of the Irish College of General Practitioners. In addition he has 1st Class honours MSc in Occupational Health and Ergonomics (NUIG) and is a member of the Faculty of Occupational Medicine of the Royal College of Physicians of Ireland. He is also a member of the Irish society of Occupational Medicine and has lectured on the Higher Diploma in Occupational Medicine course (UCD) in ‘04/’05. 2011 ©Copyright Healthwell Clinic. All rights reserved.